For other uses, see In God We Trust (disambiguation). "In God We Trust" is a phrase used in Civil Religion. It is the official motto of the United States of America, Nicaragua, and of the U.S. state of Florida. It was adopted as the United States' motto in 1956 as a replacement or alternative to the unofficial motto of E pluribus unum, which was adopted when the Great Seal of the United States was created and adopted in 1782. "In God We Trust" first appeared on the two-cent piece in 1864 and has appeared on paper currency since 1957. A law passed in a Joint Resolution by the 84th Congress (P.L. 84-140) and approved by President Dwight Eisenhower on July 30, 1956, declared "In God We Trust" must appear on American currency. This phrase was first used on paper money in 1957, when it appeared on the one-dollar silver certificate. The first paper currency bearing the phrase entered circulation on October 1, 1957. The 84th Congress later passed legislation (P.L. 84-851), also signed by President Eisenhower on July 30, 1956, declaring the phrase to be the national motto. Some groups and people have expressed objections to its use, contending that its religious reference violates the Establishment Clause of the First Amendment. These groups believe the phrase should be removed from currency and public property. In lawsuits, this argument has so far not overcome the interpretational doctrine of accommodationism, which allows government to endorse religious establishments as long as they are all treated equally. According to a 2003 joint poll by USA Today, CNN, and Gallup, 90% of Americans support the inscription "In God We Trust" on U.S. coins. In 2006, "In God We Trust" was designated as the motto of the U.S. state of Florida. Its Spanish equivalent, En Dios Confiamos, is the motto of the Republic of Nicaragua. Salmon P. Chase, Treasury Secretary, scribes "In God is Our Trust," scratches out "is Our" and overwrites "We" to arrive at "In God We Trust" in a December 9, 1863, letter to James Pollock, Director of the Philadelphia Mint. In 1860, the phrase was used in the Coat of arms of New Westminster, Canada. The phrase has been included in many hymns and religious-patriotic songs. During the American Civil War, the 125th Pennsylvania Infantry for the Union Army assumed the motto "In God we trust" in early August 1862. William W. Wallace, coiner, circa August 1862, of the motto "In God We Trust" was Captain of Company C of the 125th Pennsylvania Infantry. The Reverend Mark R. Watkinson of 'Ridleyville', Pennsylvania, (pastor of Prospect Hill Baptist Church in present-day Prospect Park, Pennsylvania) in a letter dated November 13, 1861, petitioned the Treasury Department to add a statement recognizing "Almighty God in some form on our coins" in order to "relieve us from the ignominy of heathenism". At least part of the motivation was to declare that God was on the Union side of the Civil War. Treasury Secretary Salmon P. Chase acted on this proposal and directed the then-Philadelphia Director of the Mint, James Pollock, to begin drawing up possible designs that would include the religious phrase. Chase chose his favorite designs and presented a proposal to Congress for the new designs in late 1863. In December 1863, Abraham Lincoln's Secretary of the Treasury decided on a new motto, "In God We Trust," to engrave on U.S. coins. Lincoln's involvement in this decision is unclear. A version of the motto made an early appearance on obverse side of the twenty dollar interest bearing note issued in 1864 along with the motto "God and our Right". As Chase was preparing his recommendation to Congress, it was found that the Act of Congress dated January 18, 1837 prescribed the mottoes and devices that should be placed upon the coins of the United States. This meant that the mint could make no changes without the enactment of additional legislation by the Congress. Such legislation was introduced and passed as the Coinage Act of 1864 on April 22, 1864, allowing the Secretary of the Treasury to authorize the inclusion of the phrase on one-cent and two-cent coins. An Act of Congress passed on March 3, 1865, allowed the Mint Director, with the Secretary's approval, to place the motto on all gold and silver coins that "shall admit the inscription thereon". In 1873, Congress passed the Coinage Act, granting that the Secretary of the Treasury "may cause the motto IN GOD WE TRUST to be inscribed on such coins as shall admit of such motto". The use of "In God We Trust" has been interrupted. The motto disappeared from the five-cent coin in 1883, and did not reappear until production of the Jefferson nickel began in 1938. However, at least two other coins minted in every year in the interim still bore the motto, including the Morgan dollar and the Seated Liberty half dollar. The omission of the motto "In God We Trust" on the Indian Head eagle coin caused public outrage, and prompted Congress to pass a bill mandating its inclusion. Mint Chief Engraver Charles E. Barber added the words and made minor modifications to the design. In 1908, Congress made it mandatory that the phrase be printed on all coins upon which it had previously appeared. This decision was motivated after a public outcry following the release of a $20 coin which did not bear the motto. The motto has been in continuous use on the one-cent coin since 1909, and on the ten-cent coin since 1916. It also has appeared on all gold coins and silver dollar coins, half-dollar coins, and quarter-dollar coins struck since July 1, 1908. Since 1938, all US coins have borne the motto. During the Cold War era, the government of the United States sought to distinguish itself from the Soviet Union, which promoted state atheism and thus implemented antireligious legislation. The 84th Congress passed a joint resolution "declaring IN GOD WE TRUST the national motto of the United States". The resolution passed both the House and the Senate unanimously and without debate. The law was signed by President Eisenhower on July 30, 1956. The United States Code at 36 U.S.C. § 302, now states: "'In God we trust' is the national motto." Aronow v. United States was the first case to challenge the inclusion of "In God We Trust" on U.S. currency. The law it challenged was "31 U.S.C. § 324a "the inscription 'In God we Trust'...shall appear on all United States currency and coins". O'Hair v. Blumenthal (1978) challenged the inclusion of the phrase "In God We Trust" on U.S. currency. A similar decision was reached by the Fifth Circuit in Madalyn Murray O'Hair vs W. Michael Blumenthal in 1979, which affirmed that the "primary purpose of the slogan was secular." In March 2001, Governor of Mississippi Ronnie Musgrove signed legislation requiring the motto "In God We Trust" to be displayed in every public school classroom, as well as the school auditoriums and cafeterias, throughout the state. After the September 11 attacks in 2001, many public schools across the United States posted "In God We Trust" framed posters in their "libraries, cafeterias and classrooms". The American Family Association supplied several 11-by-14-inch posters to school systems and vowed to defend any legal challenges to the displaying of the posters. According to a 2003 joint poll by USA Today, CNN, and Gallup, 90% of Americans support the inscription "In God We Trust" on U.S. coins. In 2006, on the 50th anniversary of its adoption, the Senate reaffirmed "In God We Trust" as the official national motto of the United States of America. In Florida House Bill no. 1145, Florida adopted 'In God We Trust' as the official state motto, effective July 1, 2006. In 2011 the House of Representatives passed an additional resolution reaffirming "In God We Trust" as the official motto of the United States, in a 396–9 vote. In 2013, a federal court rejected a challenge, brought by Michael Newdow and the Freedom From Religion Foundation, to remove "In God We Trust" from American currency. 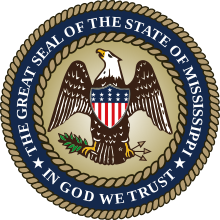 On January 31, 2014, purporting to defend religious freedom, the Mississippi senate voted to add the words, "In God We Trust" to the state seal and the change was made effective on July 1, 2014. In 2015 the county police department of Jefferson County, Illinois announced that the words "In God We Trust" will be on police squad cars. In 2015, the Freedom from Religion Foundation demanded that local authorities remove decals of the motto from Childress, Texas Police Department patrol vehicles. In response, Police Chief Adrian Garcia told the organization, in a written letter, to "go fly a kite." In March 2017, Act 911, sponsored by State Rep. Jim Dotson, made it a requirement of Arkansas state law for schools to display posters with the national motto ("In God We Trust"). In early 2018, Kimberly Daniels, a pastor who currently serves as the representative for Florida House of Representatives District 14 as a member of the Democratic Party, introduced HB 839, a bill that requires public schools to display the motto "In God We Trust" in a conspicuous place. On Tuesday, January 23, 2018, the bill received unanimous approval from the House PreK-12 Innovation Subcommittee. Later, in a vote on February 21, 2018, the bill passed 97 to 10 in the House. As part of Florida's March 2018 K-12 education law, Gov. Rick Scott mandated that all public schools post the state motto ("In God We Trust") in a prominent location. In March 2018, a bill requiring Tennessee schools to prominently display the national motto ("In God We Trust") sponsored by Rep. Susan Lynn passed the state House with 81 of the 99 members voting in favor of it. In Judaism and Christianity, the official motto "In God We Trust" is not found verbatim in any verses from the Bible, but very closely in the Old Testament in Psalm 91:2, "I will say of the LORD, He is my refuge and my fortress: my God; in him will I trust" and in the New Testament in 2 Corinthians 1:10, "Who delivered us from so great a death, and doth deliver: in whom we trust that he will yet deliver us." The concept is paraphrased in Psalm 118:8, Psalm 40:3, Psalm 73:28, and Proverbs 29:25. In Islam the word for the concept of reliance on God is called Tawakkul; the phrase "In God We Trust" is literally found in two places of the Quran, in Surah 10 Yunus, as well as Surah 7 Al-A'raf, and several other verses reinforce this concept. Melkote Ramaswamy, a Hindu American scholar, writes that the presence of the phrase "In God We Trust" on American currency is a reminder that "there is God everywhere, whether we are conscious or not." In the 1994 film Miracle on 34th Street, just as Henry is about to make his decision, Susan walks up to him with a Christmas card containing a $1 bill. On the back, the words "In God We Trust" are circled. He realizes that, since the U.S. Department of Treasury can put its official faith in God with no hard evidence, then the people can believe in Santa in the same way. Left with no choice, an elated Henry dismisses the case and declares that Santa is real, existing in the person of Kris. In the musical Hamilton, Aaron Burr says the line "My God! In God we trust, but we’ll never know what got discussed" in reaction to Thomas Jefferson, James Madison, and Alexander Hamilton making a deal. An e-mail conspiracy theory is that "In God We Trust" was intentionally omitted from new U.S. dollar coins in 2007. The first coins produced under the Presidential $1 Coin Program did indeed lack the "In God We Trust" inscription along their edges (along with the "E Pluribus Unum" inscription, the year of production, and the mint mark; these coins, unlike normal dollar coins, had completely blank edges), but these coins, known as "godless dollars", were the result of a minting error, not a deliberate omission. Marty Feldman's satirical comedy In God We Tru$t (1980). The film They Live (1988) plays on the idea. Special sunglasses allow the wearers to see simple hidden messages instead of the signs they see without them. Advertising is seen as "OBEY", "CONSUME" and "MARRY AND REPRODUCE". Dollar bills are all marked "THIS IS YOUR GOD". In January 2006, Laurence Llewelyn-Bowen and his wife Jackie were offered a place on the Valentine's Day celebrity couples edition of Who Wants to Be a Millionaire? They appeared on the show managing to reach the £1 million question, before answering it incorrectly and dropping from £500,000 all the way down to just £32,000 (a loss of £468,000). Llewelyn-Bowen and his wife claimed that the last question "didn't meet their standards". The allegedly misleading question was "Translated from the Latin, what is the motto of the United States?" The answer given was "In God We Trust" which is originally English and has in fact been the motto of the United States since 1956. The intended answer had been "One Out of Many" which is a translation of the Latin phrase E pluribus unum, which is not actually the current United States motto. E pluribus unum had been the de facto motto but was never legally declared as such. As of April 1, 2016 the following U.S. states currently offer an "In God We Trust" license plate as a speciality plate for an additional normal vehicle registration processing which vary from state to state: Alaska, Arizona, Arkansas, Florida, Indiana, Kansas, Kentucky, Louisiana, North Carolina, Ohio, Oklahoma, Pennsylvania, South Carolina, Tennessee, Texas, Utah, Virginia, West Virginia, and Wisconsin. Florida (Which also offers a speciality plate) and Georgia which both display the county of issuance on their License Plate offer the option of "In God We Trust" in place of the County Name. The constitutionality of the phrase "In God We Trust" has been upheld according to the judicial interpretation of accommodationism, whose adherents state that this entrenched practice has not historically presented any constitutional difficulty, is not coercive, and does not prefer one religious denomination over another. In Zorach v. Clauson (1952), the Supreme Court also wrote that the nation's "institutions presuppose a Supreme Being" and that government recognition of God does not constitute the establishment of a state church as the Constitution's authors intended to prohibit. On the other hand, advocates of separation of church and state have questioned the legality of this motto asserting their opinion that it is a violation of the United States Constitution, prohibiting the government from passing any law respecting an establishment of religion. As such "In God We Trust" as a national motto and on U.S. currency has been the subject of numerous unsuccessful lawsuits by these individuals. The motto was first challenged in Aronow v. United States in 1970, but the United States Court of Appeals for the Ninth Circuit ruled: "It is quite obvious that the national motto and the slogan on coinage and currency 'In God We Trust' has nothing whatsoever to do with the establishment of religion. Its use is of patriotic or ceremonial character and bears no true resemblance to a governmental sponsorship of a religious exercise." In Lynch v. Donnelly (1984), the Supreme Court wrote that acts of "ceremonial deism" are "protected from Establishment Clause scrutiny chiefly because they have lost through rote repetition any significant religious content". In June 2006, a federal judge rejected Michael Newdow's Establishment Clause lawsuit on the grounds that the minted words amount to a secular national slogan, and do not dictate anyone's beliefs. Newdow stated that he would appeal the ruling, although it should be noted that Aronow was decided on the same grounds in the Ninth Circuit and the lower court was required to return the same ruling, likewise the Ninth Circuit does not traditionally overrule previous Ninth Circuit rulings. On December 4, 2007, Newdow argued before a three-judge panel of the Ninth Circuit to remove both "under God" from the Pledge of Allegiance (Roe v. Rio Linda Union School District), and "In God We Trust" from United States currency. The Ninth Circuit rejected Newdow's challenge. In a decision published March 11, 2010, the court held that its earlier decision in Aronow, which "held the national motto is of a "patriotic or ceremonial character," has no "theological or ritualistic impact," and does not constitute "governmental sponsorship of a religious exercise," foreclosed Newdow's argument. In an opinion concurring only in the judgment, even the Judge Stephen Reinhardt agreed that Aronow was controlling precedent. Newdow v. Congress, 598 F.3d 638 (9th Cir. 2010) cert. denied 131 S. Ct. 1612 (U.S. 2011). AKA: The "In God We Trust Case" – A prominent atheist, Michael Newdow, filed a suit to declare the national motto – In God We Trust – unconstitutional and to have it removed from coins and currency. Pacific Justice Institute intervened as a defendant and defended against the suit. The case was dismissed by the trial court and the Ninth Circuit affirmed that decision. In 2015, David F. Bauman dismissed a case against the Matawan-Aberdeen Regional School District brought by a student of the district and the American Humanist Association that argued that the phrase "under God" in the Pledge of Allegiance created a climate of discrimination because it promoted religion, making non-believers "second-class citizens". He noted; "As a matter of historical tradition, the words 'under God' can no more be expunged from the national consciousness than the words 'In God We Trust' from every coin in the land, than the words 'so help me God' from every presidential oath since 1789, or than the prayer that has opened every congressional session of legislative business since 1787." President Theodore Roosevelt took issue with using the motto on coinage considering its usage "dangerously close to sacrilege". Grand Army of the Republic Memorial (Siloam Springs, Arkansas) engraved with the words "IN GOD WE TRUST"
^ Annual report – American Civil Liberties Union, Volume 5. American Civil Liberties Union. 1951. Retrieved 1 May 2012. In 1956, an official national motto was adopted, "In God We Trust," replacing the unofficial "E Pluribus Unum." ^ Refiguring Mass Communication: A History. University of Illinois Press. 24 March 2010. Retrieved 1 May 2012. He held high the Declaration of Independence, the Constitution, and the nation's unofficial motto, e pluribus unum, even as he was recoiling from the party system in which he had long participated. ^ a b c d U.S. Department of the Treasury (2011). "History of 'In God We Trust'". www.treasury.gov. Retrieved 2017-03-14. ^ "U.S. on the History of "In God We Trust"". United States Department of the Treasury. Retrieved 2009-04-22. ^ United States Public Law 84-851, United States Public Law 84-851. ^ 12 Mar 2010 (2010-03-12). "Atheist in battle to remove 'In God We Trust' from US currency". London: Telegraph. Retrieved 2014-02-04. ^ Drakeman, Donald L. (1 January 1991). Church-state Constitutional Issues: Making Sense of the Establishment Clause. Greenwood Press. ISBN 9780313276637. ^ a b http://www.n-state.com, NSTATE, LLC:. "Florida State Motto In God We Trust". www.netstate.com. ^ a b "State Motto – Florida Department of State". dos.myflorida.com. ^ Chase, Salmon P (December 9, 1863). Letter to James Pollock. Document # RG 104_UD 87-A_Folder In God We Trust 1861_Part1. National Archives and Records Administration. p. 11. ^ The Regimental Committee, 125th PA Volunteers, 1862–1863 (2009). Regimental History. Ithaca, NY: Cornell University Library. pp. 150–152. ISBN 978-1-112-13570-5. ^ Alexander, ted (2011). The Battle of Antietam. Charleston, SC: The History Press. p. 76. ISBN 978-1-60949-179-6. ^ 125th PA Vol. Infantry: IN GOD WE TRUST. YouTube. 28 June 2012. ^ Regimental Committee 1906, p. 151. ^ "History of 'In God We Trust'". U.S. Department of the Treasury. Retrieved 3 October 2013. ^ United States (1897). Congressional Serial Set. US: Government Printing Office, p. 260. ^ a b c d e f "History of 'In God We Trust'". treasury.gov. Retrieved 2016-04-29. ^ Duncan, Ann W. (2008). Religion, Rhetoric, and Ritual in the U.S. Government," Church-state Issues in America Today. Westport CT: Greenwood Publishing Group, pp. 77. ^ According to The Congressional Record (1908, House), p. 3387, the motto was adopted "doubtless with his [Lincoln's] knowledge and approval." ^ Begley, Sarah (January 13, 2016). "How 'In God We Trust' Got on the Currency in the First Place". Time. Retrieved February 24, 2018. ^ "10 Interesting Facts About Theodore Roosevelt". Republicanpresidents.net. Retrieved 2014-02-04. ^ Merriman, Scott A. Religion and the Law in America: An Encyclopedia of Personal Belief and Public Policy. Santa Barbara, CA: ABC-CLIO, 2007. Print. "In 1956, the United States, changed its motto to "In God We Trust," in large part to differentiate itself from the Soviet Union, its Cold War enemy that was widely seen as promoting atheism." ^ "New National Motto Of U. S. Recalls Key's Words Of 1814". Palladium-Item. Richmond, Indiana. 13 Aug 1956. p. 8. Retrieved 2018-02-15 – via Newspapers.com. ^ Miller, Douglas and Nowak, Marion, The Fifties: The Way We Really Were. 1977, 89. "'In God We Trust' was adopted as the national motto in 1956, with neither debate nor a single dissenting vote in the House or Senate." ^ "The legislation placing "In God We Trust" on national currency | US House of Representatives: History, Art & Archives". history.house.gov. 1955-07-11. Retrieved 2017-05-13. ^ a b Aronow v. United States , 432 F.2d 242, 243 (9th Cir. October 6, 1970). ^ Duncan, Ann W. (2008). Church-state Issues in America Today. Westport CT: Greenwood Publishing Group, p. 88. ^ "Page not found". Archived from the original on 7 August 2007. Retrieved 20 December 2017. ^ Press, The Associated (25 March 2001). "National News Briefs; 'In God We Trust' Motto For Mississippi Schools". Retrieved 20 December 2017 – via NYTimes.com. ^ "USATODAY.com – 'In God We Trust' pressed for schools". usatoday.com. 19 February 2002. ^ Felicia Sonmez (1 November 2011). "Social issues return to fore with 'In God We Trust' resolution". The Washington Post. Retrieved 7 November 2011. In 2006, on the 50th anniversary of its adoption, the Senate reaffirmed 'In God We Trust' as the official national motto of the United States," Forbes said in a statement announcing the vote. "Tomorrow, the House of Representatives will have the same opportunity to reaffirm our national motto and directly confront a disturbing trend of inaccuracies and omissions, misunderstandings of church and state, rogue court challenges, and efforts to remove God from the public domain by unelected bureaucrats. ^ Jennifer Steinhauer (3 November 2011). "In God We Trust, With the House's Help". The New York Times. Retrieved 7 November 2011. Citing a crisis of national identity and mass confusion among Americans about their nation's motto, the House on Tuesday voted on a resolution "reaffirming 'In God We Trust' as the official motto of the United States." ^ Todd Starnes (3 November 2011). "See Which Congressmen Voted Against 'In God We Trust'". Fox News. Archived from the original on 2011-11-04. Retrieved 7 November 2011. The House of Representatives passed a bi-partisan resolution Tuesday night reaffirming "In God We Trust" as the official motto of the United States. The 396–9 vote came at the request of Rep. Randy Forbes (R-VA). ^ "Lawsuit to remove 'In God We Trust' from money gets dismissed - KSL.com". ksl.com. ^ Mississippi Legislature (January 2014). "Mississippi Religious Freedom Restoration Act; enact and modify the great seal" (PDF). Senate Bill No. 2681. Mississippi: State of Mississippi. Archived from the original (PDF) on April 2, 2014. Retrieved April 2, 2014. ^ "'In God We Trust' to be placed on Jefferson Co., IL squad cars" (Archive). KFVS. August 1, 2015. Retrieved on August 2, 2015. ^ "Atheist Group Asks Police Remove 'In God We Trust' Car Decal". dailysignal.com. ^ News, Charlene Aaron/CBN. "Apostle Kimberly Daniels Scores Big Win for Prayer in Public Schools". charismanews.com. ^ "Schools could be required to display 'In God we trust'". Sun Sentinel. Retrieved 2018-03-22. ^ CNN, Joe Sterling,. "Florida lawmakers advance a bill that requires 'In God We Trust' displayed on school grounds". cnn.com. ^ "Florida lawmakers advance bill that would require 'In God We Trust' to be visible on all school buildings". newsweek.com. 23 February 2018. ^ "In God We Trust: The Motto". All About History. Retrieved 2013-02-26. ^ "Verses including the word Putting One's Trust in Allah (Tawakkul)". Quran Index. Retrieved 2016-06-16. ^ Ramaswamy, Melkote (2012-08-11). "Faith/Values | Indianapolis Star". indystar.com. Retrieved 2014-02-04. ^ David S Morgan (2007-03-07). ""Godless" Dollar Coins Slip Through Mint". CBS News. Retrieved 2010-11-03. ^ Rothkopf, Joshua (2014-10-27). ""Empire of the Sunglasses: How 'They Live' Took on Republicans and Won", by Joshua Rothkopf, ''Rolling Stone''". Rollingstone.com. Retrieved 2018-03-22. ^ "TV designer's second shot at £1m". British Broadcasting Corporation. 13 January 2006. Retrieved 22 May 2015. ^ a b Richard H. Fallon (2004). The Dynamic Constitution: an Introduction to Americans Constitutional Law. Cambridge University Press. p. 60. ISBN 978-0-521-60078-1. "Strict separationists" believe that the government has no business supporting religious beliefs or institutions in any way – for example, by providing tax breaks to churches, assisting parochial schools, including prayers or benedictions in public ceremonies, or inscribing "In God We Trust" on the currency. Religious accommodationists can well explain why certain entrenched social practices (such as the inscription of "In God We Trust" on the currency) were not historically perceived as presenting constitutional difficulties: The relevant practices are not coercive and do not prefer one narrow sect over another. ^ ABA Journal Sep 1962. Much more recently, in 1952, speaking through Mr. Justice Douglas in Zorach v. Clauson, 343 U.S. 306, 313, the Supreme Court repeated the same sentiments, saying: We are a religious people whose institutions presuppose a Supreme Being. Mr. Justice Brewer in the Holy Trinity case, supra, mentioned many of these evidences of religion, and Mr. Justice Douglas in the Zorach case referred to ... [P]rayers in our legislative halls; the appeals to the Almighty in the messages of the Chief Executive; the proclamation making Thanksgiving Day a holiday; "So help me God" in our courtroom oaths – these and ... other references to the Almighty ... run through our laws, our public rituals, our ceremonies ... the supplication with which the Court opens each session: "God save the United States and this Honorable Court" (312–313). To this list may be added tax exemption of churches, chaplaincies in the armed forces, the "Pray for Peace" postmark, the widespread observance of Christmas holidays, and, in classrooms, singing the fourth stanza of America which is prayer invoking the protection of God, and the words "in God is our trust" as found in the National Anthem, and the reciting of the Pledge of Allegiance to the Flag, modified by an Act of Congress of June 14, 1954, to include the words "under God. ^ Markoe, Lauren (2014-05-29). "Atheists Lose Latest Battle To Remove 'In God We Trust' From U.S. Currency". huffingtonpost.com. Religion News Service. Retrieved 2014-10-09. ^ Aronow, 432 F.2d at 243. ^ "Federal Judge Nixes 'In God We Trust' Lawsuit". Fox News Channel. 2006-06-12. Archived from the original on 2012-10-21. Retrieved 2018-02-24. ^ "Newdow v. Congress of the United States" (PDF). findlaw.com. Archived from the original (PDF) on 2016-03-04. Retrieved 2018-02-24. ^ "Newdow v. Lefevre, No. 06-16344, at 4210 (9th Cir. Mar. 11, 2010) (citing Aronow, 432 F.2d at 243–44)" (PDF). ^ "Matt Rees, The Judge the Supreme Court Loves to Overturn, The Weekly Standard, May 5, 1997;". Archived from the original on 2010-05-16. Retrieved 2018-02-24. compare "David G. Savage, Crusading Liberal Judge Keeps High Court Busy, L.A. Times, Mar. 3, 1996". The Los Angeles Times. 1996-03-03. ^ "Newdow, at 4210–11 (Reinhardt, J., concurring)" (PDF). ^ Salvador Rizzo. "Hearing 'Under God' in Pledge of Allegiance does not violate rights of atheist students, NJ judge rules". NorthJersey.com. Retrieved February 29, 2016. ^ "Judge Refuses To Kick God Out Of Public Schools". Forbes. February 7, 2015. Retrieved February 29, 2016. ^ "ROOSEVELT DROPPED 'IN GOD WE TRUST'; President Says Such a Motto on Coin Is Irreverence, Close to Sacrilege. NO LAW COMMANDS ITS USE He Trusts Congress Will Not Direct Him to Replace the Exalted Phrase That Invited Constant Levity". The New York Times. November 14, 1907. Retrieved 26 August 2010. Wikimedia Commons has media related to In God We Trust. Final answer? Not quite as star gets second chance to play for a million – article in The Guardian about a disputed quiz question about the motto of the United States. Federal Reserve Notes, also United States banknotes or U.S. banknotes, are the banknotes currently used in the United States of America. Denominated in United States dollars, Federal Reserve Notes are printed by the United States Bureau of Engraving and Printing on paper made by Crane & Co. of Dalton, Massachusetts. Federal Reserve Notes are the only type of U.S. banknote currently produced. Federal Reserve Notes are authorized by Section 16 of the Federal Reserve Act of 1913 and are issued to the Federal Reserve Banks at the discretion of the Board of Governors of the Federal Reserve System. The notes are then put into circulation by the Federal Reserve Banks, at which point they become liabilities of the Federal Reserve Banks and obligations of the United States. 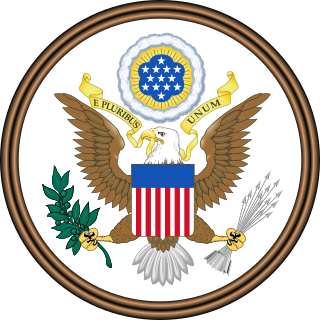 E pluribus unum —Latin for "Out of many, one" —is a 13-letter traditional motto of the United States, appearing on the Great Seal along with Annuit cœptis and Novus ordo seclorum, and adopted by an Act of Congress in 1782. Never codified by law, E pluribus unum was considered a de facto motto of the United States until 1956 when the United States Congress passed an act, adopting "In God We Trust" as the official motto. 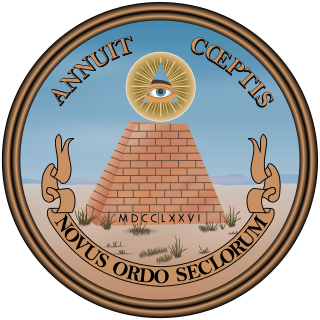 Annuit cœptis is one of two mottos on the reverse side of the Great Seal of the United States. Taken from the Latin words annuo, "to nod" or "to approve", and coeptum, "commencement, undertaking", it is literally translated, "[providence] favors our undertakings" or "[providence] has favored our undertakings". The United States one-dollar bill ($1) is a denomination of United States currency. An image of the first U.S. President (1789–1797), George Washington, based on the Athenaeum Portrait, a painting by Gilbert Stuart, is currently featured on the obverse, and the Great Seal of the United States is featured on the reverse. The one-dollar bill has the oldest overall design of all U.S. currency currently being produced. The obverse design of the dollar bill seen today debuted in 1963 when it was first issued as a Federal Reserve Note. Michael Arthur Newdow is an American attorney and emergency medicine physician. He is best known for his efforts to have recitations of the current version of the Pledge of Allegiance in public schools in the United States declared unconstitutional because of its inclusion of the phrase "under God". He also filed and lost a lawsuit to stop the invocation prayer at President Bush's second inauguration and in 2009 he filed a lawsuit to prevent references to God and religion from being part of President Obama's inauguration. The Presidential $1 Coin Program was the release by the United States Mint of $1 coins with engravings of relief portraits of U.S. presidents on the obverse and the Statue of Liberty on the reverse. Aronow v. United States was the first case to challenge the inclusion of "In God We Trust" on U.S. currency. The law it challenged was "31 U.S.C. § 324a "the inscription 'In God we Trust'...shall appear on all United States currency and coins". The Coinage Act of 1864 was passed on April 22, 1864. The United States federal law changed the composition of the one-cent coin and authorized the minting of the two-cent coin. The Director of the United States Mint developed the designs for these coins for final approval of the Secretary of the Treasury. As a result of this law, the phrase "In God We Trust" first appeared, on the 1864 two-cent coin. An Act of Congress, passed on March 3, 1865, allowed the Mint Director, with the Secretary's approval, to place the phrase on all gold and silver coins that "shall admit the inscription thereon." In 1956, "In God We Trust" replaced "E Pluribus Unum" as the national motto. All currency was printed and minted with the new motto. "Draped Bust" was the name given to a design of United States coins. It appeared on much of the regular-issue copper and silver United States coinage, 1796–1807. It was designed by engraver Robert Scot. The modern motto of the United States of America, as established in a 1956 law signed by President Dwight D. Eisenhower, is "In God We Trust". The phrase first appeared on U.S. coins in 1864. The Fugio Cent is the first official one-cent piece of United States currency. Consisting of 0.36 oz of copper, its design was inspired by the works of Benjamin Franklin. The United States dollar is the official currency of the United States and its territories per the United States Constitution since 1792. In practice, the dollar is divided into 100 smaller cent (¢) units, but is occasionally divided into 1000 mills (₥) for accounting. The circulating paper money consists of Federal Reserve Notes that are denominated in United States dollars. The Texas Centennial half dollar commemorative coin was minted to honor the Centennial of Texas's independence from Mexico. Early in the administration of President Franklin Delano Roosevelt, on June 15, 1933, Congress passed an act to authorize the coinage of silver half dollars "in commemoration of the one hundredth anniversary in 1936 of the independence of Texas, and of the noble and heroic sacrifices of her pioneers, whose revered memory has been an inspiration to her sons and daughters during the past century." This was the first of over two dozen commemorative bills that would become reality during Roosevelt's tenure. The legislation provided that "no more than one and a half million pieces" be created on behalf of the American Legion Texas Centennial Committee, located in Austin in that state. The District of Columbia and United States Territories Quarter Program was a one-year coin program of the United States Mint that saw quarters being minted in 2009 to honor the District of Columbia and the unincorporated United States insular areas of Puerto Rico, Guam, United States Virgin Islands, American Samoa, and the Northern Mariana Islands. The islands commonly grouped together as the United States Minor Outlying Islands were not featured, as the law defined the word "territory" as being limited to the areas mentioned above. It followed the completion of the 50 State Quarters program. The coins used the same George Washington obverse as with the quarters of the previous ten years. The reverse of the quarters featured a design selected by the Mint depicting of the federal district and each territory. Unlike on the 50 State quarters, the motto "E Pluribus Unum" preceded and was the same size as the mint date on the reverse.